Recent news about shopping from English-language newsfeeds around the world. Regional Directory News. Fri, 19 Apr 2019 04:35:09 -0400. 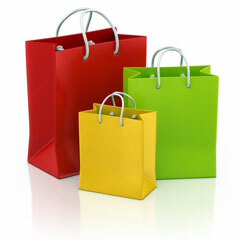 Shopping, the purchase of goods and services, is a necessary and enjoyable consumer activity. This directory includes an extensive selection of local and online stores for your shopping convenience. The Quisto editorial staff has evaluated these websites and placed them in the Shopping information category. Visit Collections Etc. for a variety of home decor, housewares and outdoor accessories. Extensive online shopping site for products that make life easier and more comfortable, including home and garden products, personal care items, gifts, and kitchen appliances. One stop shopping for home furnishings, garden decor, candle holders, children's toys, and birthday and Christmas gifts. Carries a vast selection of value-priced novelties, toys, party supplies, favors, crafts, decorations, treats, and gifts for every season and occasion. Great resource for parents, educators, businesses and event planners. Easy access to hundreds of merchants, thousands of brands, and millions of products. Shopping search engine plus consumer reviews and ratings.